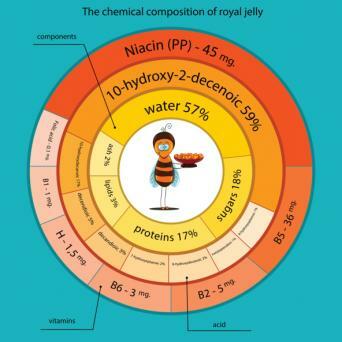 Royal jelly is a nutrient packed, milky substance produced by bees. Within the beehive community, it's truly food fit for the aristocracy since it's the food of queen bees. It's also used to feed bee larvae and research shows it may be used to feed other bees in the hive. But this unique substance is not just for bees. Humans can also reap the health benefits of royal jelly. As with many other natural substances, royal jelly research on humans is limited. But many animal and laboratory studies support the health benefits of royal jelly. 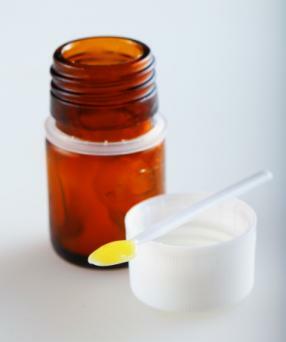 Royal jelly may help lessen the growth of Bisphenol A (BPA) breast cancer cells. In addition, a supplement (GE132+Natural) containing royal jelly, lycopene, resveratrol, ganoderma lucidum and sulforaphane was found to inhibit the growth of prostate, colon and breast cancer cells. According to a study performed on Swiss Albino mice in Turkey, royal jelly can help protect the liver against damage caused by paracetamol (acetaminophen). A study on humans published in the Journal of Medicinal Food concluded that royal jelly has an effect on glucose levels and can lower blood sugar in the body. Royal jelly was shown to have a healing effect on acetic ulcers in rats, especially when combined with propolis. A Japanese study concluded royal jelly may help reduce cholesterol. A Turkish study determined that royal jelly may be an effective immunotherapy treatment against Graves' disease (an autoimmune disorder). 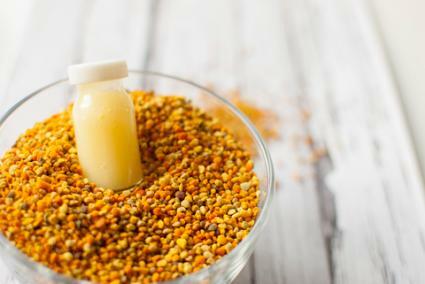 Research published in the Journal of Alternative and Complementary Medicine found that royal jelly's antibacterial properties may be effective against Staphylococcus aureus and Escherichia coli, even when combined with starch. Combining royal jelly with starch is a less expensive preparation which makes it more accessible. Royal jelly is believed to help improve brain function. A PubMed abstract reviews an exciting study that not only confirmed this belief but concluded the jelly may have a beneficial effect on Alzheimer patients. Royal jelly is believed to be beneficial to the skin. As a result, it can be found in lotions, creams and cleansers. A PubMed abstract showed royal jelly enhances collagen production and may protect the skin from UVB photo aging. Royal jelly is available in many forms: powder, capsule, fresh (frozen) or honey. According to WebMD, the proper dosage of royal jelly is determined by the age, weight and health of the user and there is not sufficient scientific information to determine recommended daily amounts. For this reason, it's very important to consult a physician or holistic health practitioner before using the product. To avoid side effects, it's suggested you begin with a lower dose and work your way up to the daily dose. In addition, if you're considering royal jelly to treat a specific health condition, you may need a higher dose and should consult your physician for guidance. Allergies: There have been reports of royal jelly causing severe allergic reaction, including anaphylaxis. If you have allergies, especially to pollen, honey or propolis, or asthma, you should avoid royal jelly. Stomach pain and bleeding: In very rare cases, royal jelly may cause a bleeding colon, leading to stomach pain and diarrhea. Skin irritation: When used on the skin, royal jelly may cause rash or aggravate dermatitis. Do not use royal jelly if you take Warfarin (Coumadin). Also, do not use royal jelly if you are pregnant or breast feeding. Royal jelly can be tricky to find in your local pharmacy or grocery store. 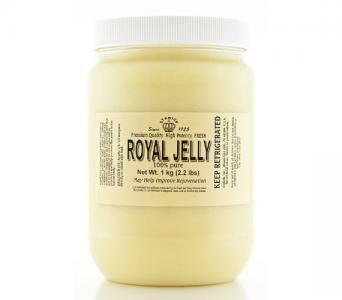 Fresh royal jelly needs to stay cold so storing the jelly on store shelves can be challenging. Although you may be lucky enough to find the supplement at a natural health store, it's more likely you'll need to order it online. 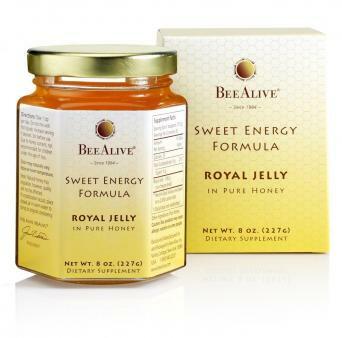 Bee Alive: For over 28 years, Bee Alive has offered high quality royal jelly products. They only use fresh royal jelly in their products. Their product line includes 100 percent pure royal jelly; royal jelly capsules; royal jelly honey, and a skin care line. Prices vary by product from $33.00 for a one-month supply or royal jelly capsules to $125.00 for a 3.53 ounce jar of 100 percent royal jelly. BeePollenBuzz.com: This site offers royal jelly in powder, capsule and fresh forms. Prices range by product type and size. A half pound bottle of fresh royal jelly costs $54.99; a half pound bottle of royal jelly powder (great for smoothies!) costs $89.99, and a bottle of 90 royal jelly capsules costs $31.99. Puritan's Pride offers two 10.5 ounce jars of royal jelly honey for $29.89. They also offer two bottles of 50 royal jelly soft chews (100 mg each) for $10.29. Shipping is free for any order. The Natural Shopper Royal Jelly Capsules: These capsules are made in the USA from organic, powdered royal jelly. A bottle of 100 capsules (1000 mg each) costs $19.95. They also have a line of skin care products that includes eye cream, body lotion, skin serum and wrinkle cream. Stakich Fresh Royal Jelly: Their 2.2 pound jar of 100 percent pure, fresh royal jelly costs $119.00 with free shipping. Once again, those busy bees have proven they know what they're doing. As studies continue to show the impressive health benefits of royal jelly, more and more people are paying attention. When it comes to good health and healing, royal jelly may be as potent (or more) as honey. If you have any of the conditions listed above or just want increased energy and wellness, talk to your doctor about trying royal jelly.